When storing flammables and combustibles, hazardous situations can occur anytime. Proper precautions are necessary to remain safe when storing or handling hazardous materials. Some regions of the country have extreme heat and require a cooling system to be implemented into a chemical storage building for full compliance, where colder regions may require a heating system be implemented. 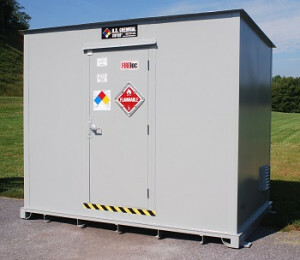 Combustible storage buildings offer safe chemical storage for outside or inside facility storage. Inventory control can play a huge factor in how volatile chemical storage is maintained. This can include a variety of handling and storing procedures, including identification, segregation, ignition control, ventilation, and temperature control. Temperature controlled combustible storage buildings are capable of storing hazardous materials at specific temperatures from 35°F or above 175°F. Temperature controls accessories include refrigeration, air conditioners and freezer units; explosion proof accessories may be necessary for certain types of chemical classes. Ensure that incompatible chemicals are stored separately; either in separate chemical storage buildings or in the same storage building with solid partition walls. Store chemicals no higher than eye level. Do not overcrowd shelves or stockpile chemical containers. Chemical containers should be labeled with proper hazard classifications and appropriate hazard warnings. Chemicals should be dated upon receipt in the lab and on opening. Be sure to implement an emergency response plan for all facility workers. Do not store hazardous chemicals in direct sunlight or near other ignition sources. Store flammable and combustible chemicals in a well ventilated area; mechanical ventilation is recommended for most hazardous chemicals. Workers should always wear personal protective equipment (PPE) when handling hazardous chemicals. Utilize bonding and grounding techniques when transferring chemicals. Completely seal all container openings after the transfer of liquids. To learn more about combustible storage buildings or safe chemical storage techniques, visit us online or call 888-294-2729 for a free chemical storage consultation.